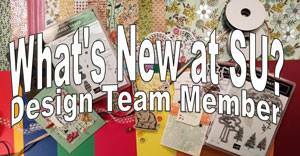 Playing with Papercrafting: TWO-gether It's Always Better! Well, what a shock we got about a week ago!! You see, my up-line, Tamara, was also a kind of surrogate daughter to me. She lived with us for three years, during which time my own daughters were away at school or on a missions trip. She helped to ease the pain of that suddenly empty house and we will always love her for that and for her own sweet self. She is now married and has two adorable kids, but that is about to change! You see, Tamara is expecting again and she has been quite ill with morning sickness and fatigue. She went for a routine ultrasound last week and got some astounding news. She is expecting TWINS! WOW! Her family of four will increase to six in a few short months. As wonderful as two babies are, it takes a lot of adjustment to figure out all the logistics and ramifications of a twin pregnancy. 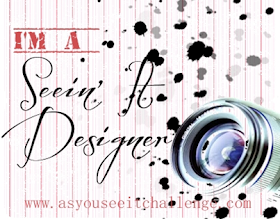 Because Tamara is one of the Design Team at As You See It Challenges, we decided to change our As You See It Challenge #028 this week to uplift Tamara and her hubby as they make this adjustment. 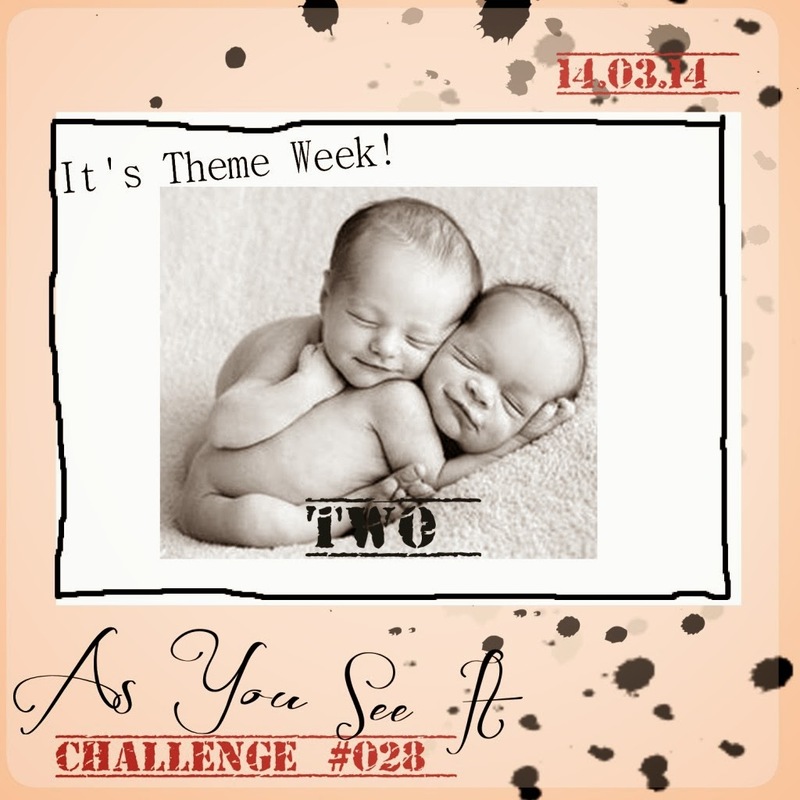 Our Challenge theme this week is TWO! And I wanted to relay the message that Tamara and her family will get by TWO-gether with all their family and friends helping them out. 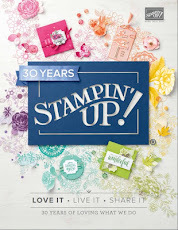 I dug out two stamp sets: Baby, We've Grown for the bunnies and Yippee Skippee for the sentiment, "Never Underestimate the Power of Two"! I did some masking in order to have one of the bunnies behind the other. I stamped the red bunny first on Whisper White, then stamped again on a Post-It Note close to the top where the sticky strip is. I cut out the Post-It Note rabbit and stuck in on the red rabbit I had just stamped. It forms a mask so that when I stamped the Coastal Cabana rabbit, the part of the stamp that fell on the mask wouldn't show after I peeled the mask off. I used my Coastal Cabana Spritzer to spray a Tea Lace Doily a Coastal Cabana colour. I cut out the bunnies using one of the Starburst Framelits. You'll notice two Whisper White starbursts there. I didn't like the job I did with rabbits the first time and rather than tear the Crumb Cake piece underneath I just used dimensionals to pop another one over top. I wanted a little more colour in the starbursts, so I die cut an additional Starburst in Real Red, the same size as the Crumb Cake one and staggered them a little so you can see small pops of red underneath. I used the Banners framelits to die cut the sentiment and a Coastal Cabana layer. 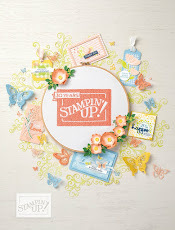 The DSP used is from the Fresh Prints Designer Series Paper Stacks. I hope seeing all these cards helps to cheer Tamara and give her encouragement for the future. I've had lots of interest on my Blog Candy Give Away. You still have lots of time to enter. Leave a comment on Wednesday's post before Saturday, Mar. 15 at 12 midnight. I will reveal the winner on Sunday morning. I had no idea you all were doing this! What a surprise when I checked your blog this morning. Definitely melted my heart and my no-cry streak of about 4 days was nearly broken!!! Thank you for such a sweet gesture! 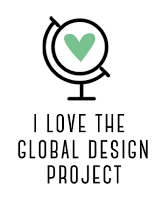 I can't wait to check everyone else's blogs, too!!! !